Not everything has to be about complex lifestyle changes and meticulous diet plans. We’ve written numerous articles about the serious, detailed ways you can get thicker hair. However, this one is going to be a little bit different. This one is dedicated to those who haven’t got the resources necessary for the aforementioned, complicated methods, be it money, time or patience. We’ll be listing ways how to get thicker hair with simple changes you can make, quick and easy. One easy way to improve the volume of your hair is to curl it up a bit. Flat, straight hair can sometimes appear thinner than it really is, so lifting it a bit helps. However, if you do have thin, weak hair or are suffering from hair loss, you should probably put a little less emphasis on this one. All products for hair curling involve either straining or lots of heat, both of which are pretty harmful for it. 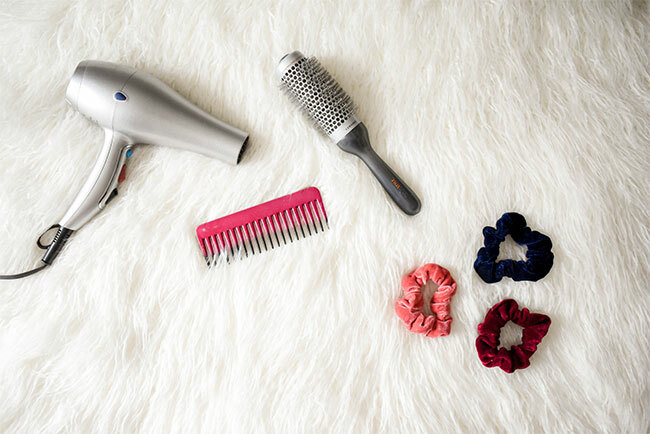 Though if it involves heat, like a curling tong, some heat protection spray will minimize the damage, yet it is still best to look for other ways to make your hair thicker. It might seem a little silly, but flipping your hair opposite of its usual parting place can give an instant volume boost. Of course, it won’t really hold its place, especially if your hair is a little shorter; so you might want to consider adding some hair spray, or even volume powder. So, how to get thicker hair with minimal chance of harming it in any way? This is probably the easiest and safest way to fix your hair up to look thicker. Provided, of course, you use non-toxic, hypoallergenic tape. If you’re not too familiar with hair extensions and their application methods, you should probably consider visiting a professional. It might cost a bit more, but the end result will be infinitely better. Plus, the whole process should take less than an hour, no matter how demanding it might be. If everything fails, supplements for thicker hair are always an effective answer. Specifically, natural hair supplements, since having artificially separated vitamins means you might be taking too much of a specific vitamin which could even have potential unwanted side effects.